A "them against us" mentality seems to be sweeping the country. All you have to do is listen to the news. Depending on your vantage point, the “other” might be perceived as the police in minority communities, Muslims in Western countries, illegal immigrants at our borders and in our cities. There is all too much demonization taking place and too few efforts at understanding. ​This past week in Chicago, a theater troupe from the ecumenical Community of Jesus in Orleans, Mass., has been traveling to various venues offering performances, workshops and panel discussions called “A Pound of Flesh: Exploring Qualities of Mercy When Encountering the Other.” The group uses Shakespeare’s The Merchant of Venice as a springboard for that exploration. 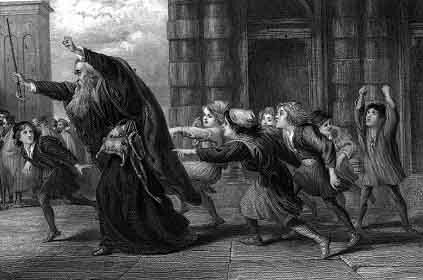 ​Sister Danielle Dwyer, director of the community’s Elements Theatre Company, calls The Merchant of Venice “an uncomfortable, confrontational play. There is no denying the hate, the prejudice, the blatant superiority.” Shakespeare’s examination of the “social lepers” of his Elizabethan society—and what it means to belong and to be human—is just as relevant today as it was in his day. “It seems we as people have an inherent need to have ‘an other,’” Dwyer says. “At times I’ve been the other, and at times I’ve created the other.” ​Dwyer tries to steer the discussion away from the literary elements of the play—for example, was Shakespeare an anti-Semite and what was his aim in writing this play? Instead, Dwyer encourages audiences to focus on the play’s broader themes and applications. “The larger issue with this work is what happens to ‘the other’ when that person is not protected.” ​At the various venues where it has been presented, the play sparked discussion about the potential hardships of a religiously-mixed marriage; the effects of an unequal economic system; and the use of legal maneuvering to undergird what is patently immoral. Sound familiar to our own time? Dwyer’s troupe first performed the play or excerpts from it at various venues in New York, including the New School and St. Malachy Church. This week, the group brought the program to Chicago Theological Seminary, Kam Isaiah Israel Synagogue and the Mayer Kaplan Jewish Community Center in Skokie. On Monday, the show will be performed for high school and college students at Dominican University in River Forest. Each performance is followed by a panel discussion that, at the various venues, has brought together actors, priests, rabbis, English professors, religion writers and diplomats. The Community of Jesus itself is an interesting model of tolerance. It consists of lay members and vowed religious as well as people from a variety of faith traditions. Members of the community aim to live the ancient monastic Rule of St. Benedict in a contemporary setting. For years, through its Arts In Conversation series, the community has used art as a starting point for theological explorations. The Elements Theatre troupe consists of 15 actors, all volunteers, and some classically trained. ​The audience response to “Encountering the Other” hasn’t always been friendly. A question Dwyer gets frequently is: why are you doing such a disturbing, uncomfortable play? I commend the Community of Jesus and its theater group for seeking to be agents of change through art. “Encountering the Other” challenges us to hold a mirror to ourselves and peer into our own prejudices and behavior. By doing so, we are stirred to make new choices, hopefully ones that lean toward mercy.